Cupcakes (or cakes) with this icing are sure to please anyone with a sweet tooth. You need a stand mixer (or a strong hand mixer) and a kitchen blowtorch for this recipe. In a heatproof bowl place the egg whites, sugar and cream of tarter and place the bowl over slowly simmering water (you don't want to cook the egg whites, only dissolve the sugar. Whisk constantly for 3-4 minutes until sugar is dissolved. Put the bowl into the stand mixer with a whisk attachment and begin whisking at low speed. Gradually increase the speed until stiff, shiny peaks appear. It will take about 7 minutes. 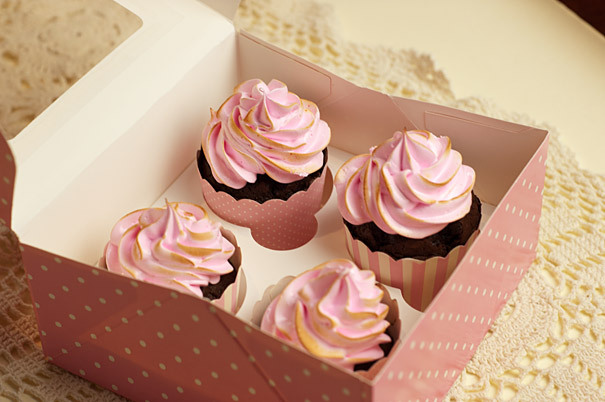 Place the icing in a pastry bag fitted with a large star tip and ice the cupcakes.